“You just have to let them think they have the power.” TNT has released a new first look at season two of Animal Kingdom. The drama revolves around a 17-year-old named “J” (Finn Cole) who moves in with his deceased mother’s family — a Southern California clan of criminals. The cast also includes Ellen Barkin, Scott Speedman, Shawn Hatosy, Ben Robson, Jake Weary, Daniella Alonso, and Molly Gordon. Season two of Animal Kingdom premieres on TNT on May 30th. What do you think? Have you seen Animal Kingdom? Are you looking forward to season two? More about: Animal Kingdom, Animal Kingdom: canceled or renewed?, TNT TV shows: canceled or renewed? 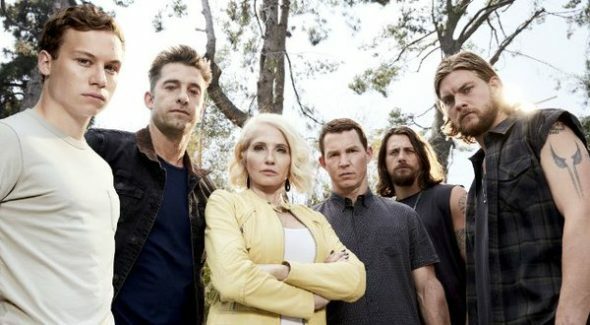 I’m so excited Animal Kingdom is coming back on.I’m bored with reality shows.This show is wild,unpredictable,and the cast are all amazing. Its way better then the original movie.The drama,and mysterious plot make it wild and I love everything about it……except all the commercials!!! That’s it? That’s what you call a Season 2 preview? Absurd! A quarter of it is soundtrack over title promotion.